It may be early, but Tyler Bozak ranks second in Maple Leafs scoring with 24 points in 26 games, and is showing signs that he can handle himself amongst the NHL’s best. Currently, he has more points than Jonathan Toews and as many as John Tavares, is 57 per cent on faceoffs, and is tied for tenth in powerplay points amongst NHL centres. But while his stats are positive, the Regina native is not jumping to any conclusions. The Maple Leafs are 5-1-1 in their last seven games, and Bozak has been a major factor. The 28-year-old has nine points over this recent tear, netting six goals in the process. This year marks Bozak’s sixth NHL season, and given his recent play it’s amazing he has yet to tally a 50 point campaign. But beyond rebounds, Bozak has created his own space this season, notching two shorthanded goals. This ties him with Thomas Plekanek for second among NHL centres, sitting two behind the Los Angeles Kings’ Tyler Toffoli. Then again, skating between the elusive Phil Kessel and hulking James van Riemsdyk, Bozak has long been considered an average forward benefiting from skilled line mates. He has only managed to play one full season, and has been criticized for his lack of consistency when healthy. Amazingly, however, his production numbers have steadily increased. 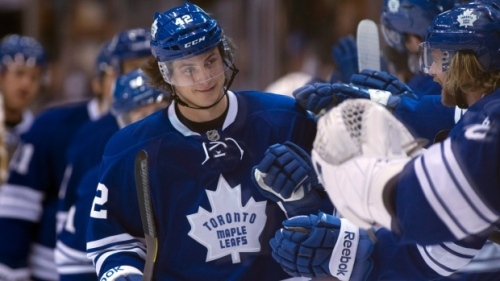 From 2009 to 2012, Bozak averaged 0.55 points-per-game, while maintaining 0.78 the past three seasons. This point increase is largely due to the JVR acquisition, though it took the initial 2012-13 shortened season for chemistry to develop. Over the past two campaigns (84 games) Bozak has sustained 0.87 points-per-game, and is not showing any signs of letting up. To put this in perspective, Jason Spezza registered 0.85 points-per-night over his last 102 contests, while Toews has tallied 0.87 points-per-game during his last 103 outings. By no means do these numbers indicate he is the same caliber, but they do suggest Toronto’s top centre has yet to reach his final peak. The Leafs are back in action tonight when they host the Calgary Flames, but number 42 might need to alter his offensive game. Six of Bozak’s 11 goals this season have come on the powerplay, though the Flames are tied with the Nashville Predators for taking the fewest penalties (69) across the league. To counter, the Leafs have scored the second most five-on-five goals this season (59) and Bozak may need to add to this total to continue his dominant play. Elite players can contribute beyond their strengths, and tonight’s matchup will test Bozak’s ability to do just that. It’s a long season, but the signs are definitely present; Bozak is improving, meaning Toronto’s top centre position may be in good hands down the stretch. If this trend continues, having Bozak locked in at $4.2 million for the next four seasons is nothing short of an absolute steal. Most importantly – though it probably won’t last – it’s fun to note that Bozak is on pace to finish the season with a new career high 76 points.